MS 3 - Flexible and adaptable! The MS-3 laser barcode scanner offers the fastest read performance in embedded compact barcode scanners. The wide scan angle of 70 degrees is coupled with ultra-compact size and flexible mounting. High performance and flexibility make the MS-3 the optimal choice for reliable reading in embedded instruments. 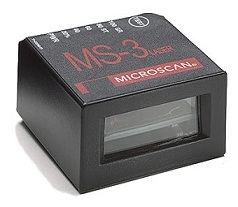 Compact & Lightweight: The 1.75” (44.5 mm) square by .85” (21.6 mm) tall scanner weighs only 2 ounces (57 g) for easy mounting onto robotic equipment or into tight spaces. High Scan Speed: Adjustable scan speed from 300 up to 1000 decodes per second and Microscan’s world-class decode algorithms ensure accurate reading every time. Wide Scan Angle: The wide scan angle of over 70 degrees and a factory customizable focal point add up to space savings within your system, allowing greater flexibility with positioning. Visible Indicators: Illuminated LEDs on top of the scanner provide visual confirmation of the scanner performance.